Scheduling a set of tasks on a set of machines so as to yield an efficient schedule is a basic problem in computer science and operations research. Most of the research on this problem incorporates the potentially unrealistic assumption that communication between the different machines is instantaneous. In this paper, we remove this assumption and study the problem of network scheduling, where each job originates at some node of a network, and in order to be processed at another node must take the time to travel through the network to that node. Our main contribution is to give approximation algorithms and hardness proofs for many of the fundamental problems in network scheduling. We consider two basic scheduling objectives: minimizing the makespan, and minimizing the average completion time. For the makespan we prove small constant factor hardness-to-approximate and approximation results for the most general forms of the problem. For the average completion time, we give a log-squared approximation algorithm; the techniques used in this approximation are somewhat general and have other applications. For example, we give the first non-trivial approximation algorithm to minimize the average completion time of a set of jobs with release dates on identical parallel machines. 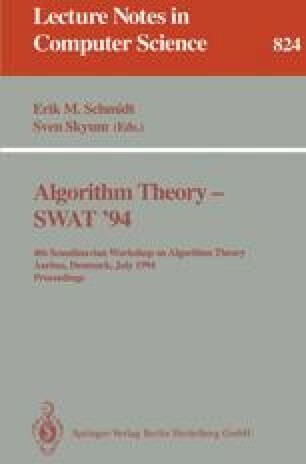 Another contribution of this paper is to introduce an interesting class of questions about the design of networks to support specific computational tasks, and to give a polylogarithmic approximation algorithm for one of those problems; specifically, we give approximation algorithms to determine the minimum cost set of machines with which to augment a network so as to make possible a schedule of a certain target length. Much of this work was done while the second and third authors were visiting Sandia National Labs, the third author was visiting DIMACS, and the second author was visiting Polytechnic University. This work was performed under U.S. Department of Energy contract number DE-AC04-76DP00789. Research partly supported by NSF Award CCR-9308701, a Walter Burke Research Initiation Award and a Dartmouth College Research Initiation Award. Research partially supported by NSF Research Initiation Award CCR-9211494 and a grant from the New York State Science and Technology Foundation, through its Center for Advanced Technology in Telecommunications.